Nestled amidst the beautiful valleys of Western Ghats, Mahabaleshwar is an enchanting hill station in the state of Maharashtra. Blessed with immense natural beauty, landscapes and pictorial panoramic views of lush green valleys, it is an ideal weekend holiday retreat for travelers. It is located at a distance of just 120 km southwest of Pune and 285 km from Mumbai. 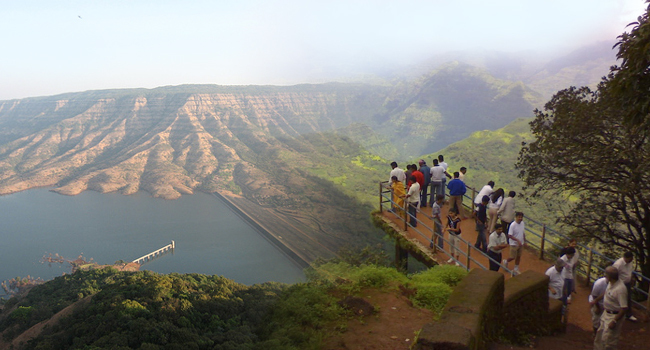 Want to make a visit to Mahabaleshwar? Explore various travel websites, book domestic flights in India online and save maximum on travel costs with advance booking. This charming hill resort is named after Lord Mahabali and the temple of the Lord Mahabali is a major landmark of Mahabaleshwar. If you are visiting Mahabaleshwar for the first time, then go through this article to know about the places you must pay visit to during your trip. Located in the Koyana Valley, at a distance of just 2.5 km from Mahabaleshwar, this waterfall is one of the most adorable sights of nature. At the earlier times, the gardens situated near the falls were taken cared by the Chinese and thus, these falls are named as Chinaman’s Waterfall. Situated at the top of Venna Lake, this waterfall provides an excellent natural abode for day picnics and fun outings. This cliff is named so because of resemblance to the look that of elephant’s head and trunk. An ideal point to enjoy enchanting views of the surrounding hills and valleys, this high point cliff is a major excursion spot for travelers visiting Mahabaleshwar. The Elephant’s Head point is located at an extreme end of the mountain ranges. Located at a proximity to the main market of Mahabaleshwar, this spot attracts a number of tourists for offering everlasting scenic views of natural beauty. Popularly known as the Blue Valley, Helen’s Point provides wonderful views of the stretch of green agricultural land, magnificent scenery of Krishna River winding its way through the tiny fields and mellow music of swiftly flowing waters of a nearby cascade. Some other tourist spots near Helen’s Point are Robbers Caves, Gavalani Point and North Coat Point. Forming a perfect post card backdrop, Lingmala Waterfall is an enchanting excursion spot near Mahabaleshwar. The streamlined water falling from the cliff appears like a thin silver streak over the hill from distance. The ideal time to capture the best of this destination’s beauty is during rainy season or monsoon. One can enjoy an array or encircles (if get lucky) of rainbow colors formed by sunrays falling on the fresh waters of the waterfall. Endowed with natural bliss, this spot is one of the most admired and loved capturing point for photographers. Best known for offering spectacular views of sunrise, Wilson point or the Sunrise Point is a huge plateau near Mahabaleshwar. Located at a height of 1439 mtrs above the sea level, it is the highest point in Mahabaleshwar from where both sunrise and sunset can be enjoyed. Apart from the sunrise and sunset, this point provides awe-inspiring views of surrounding valley and mountain ranges. Perched on an elevation of 1400 m above the sea level, Connaught Peak is the second highest mountain peak in Mahabaleshwar. Besides offering excellent views of Lake Venna and Krishna Valley, this point is an ideal location to observe the Kamalgadh, Rajgarh and Torana. Located at a distance of just 7 km from the main market, Connaught Peak is also an excellent trekking and riding peak. Author Bio: Archana Sharma is a graduate in Tourism studies and loves to write on several travel and tourism topics. Currently, she is working with BookEasyTrip.com (an excellent portal to book India tour). Archana also maintains her travel blog, BookEasyTripTravelBlog.com which is an excellent interactive platform for travelers.